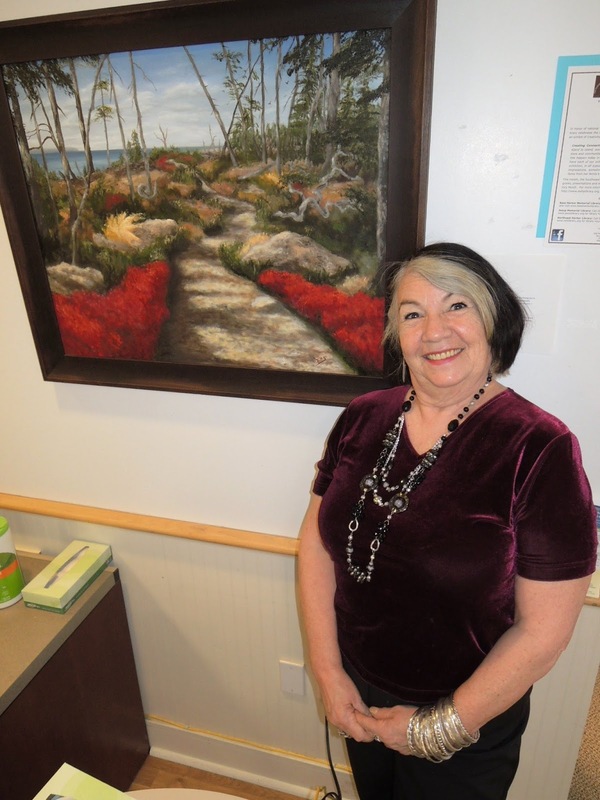 Painting is not just another creative outlet for Bass Harbor artist Barbara Strubell. Overcoming a difficult childhood and battles with addiction, her art has kept her centered, disciplined, and sober. 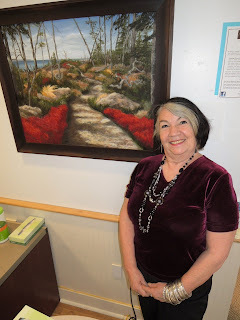 Now, Strubell wants to show Mount Desert Island just what she can do with a brush, pallet knife and canvas. An exhibition of her work opens at Southwest Harbor Public Library starting Thursday, June 1. "I really want people to see the world that I have created," she said. Strubell, 63, has lived in Maine for 40 years, drawn to the state's natural beauty. "I can remember living in a city and wishing I could see trees outside my window," said Strubell. The artist had a difficult childhood in which she lived in eight foster homes before being adopted at the age of 12. It was art that provided a positive, creative outlet in those tumultuous, formative years. Strubell was drawn to artists who paint with immediacy, color, and vibrancy. "As a troubled youngster, I was drawn right to Van Gogh," Strubell said. "I don't cry as a rule, but when I saw his self-portrait, tears came to my eyes." Years later, Strubell recalled how coming to Mount Desert Island helped her overcome some very difficult, personal challenges. "One of the reasons I paint landscapes is because, for me, part of the healing process was getting outside," said Strubell, who has been sober for 20 years. "The mountains, the woods, and the ocean are just wonderful for me. I'm a very visual person, and inspiration in nature is everywhere." In short, painting gives her peace. Strubell loves the tactile aspect of her painting. "I'm very a deliberate painter. And I can mix the colors to do whatever I want them to do. It's a very pleasing experience overall." Strubell said she loves the feel of working with oils, as well as the vibrant colors they produce. Each painting conveys a different mood, whether it's the tranquility of her big sky painting, "Sunset Over Bass Harbor," or the feminine quality of a piece of driftwood discovered on a beach in "Driftwood." With her art, Strubell conveys a range of emotions, from bliss to joy. "The last painting I did was 'A Wonderful Walk.' What I wanted to evoke is the complexity of what we have in nature. A walk in the woods is an invitation to see beauty everywhere," says Strubell. “Some of my paintings have a strong feminine aspect. While others show a certain attitude. Even a fallen tree has exceptional beauty because of its innate strength." Strubell continues with her full-time, year-round business, Artful Designs Hair Care and Art in Southwest Harbor. Her salon is festooned with her work. And while her work as a stylist helps pay the bills, it's also a creative outlet. Visit BarbaraStrubellArt.com, and artdeshair.com for more information and to see examples of her art. Like her on facebook.com/barbara.Strubell.1 and follow @bcstrubell on Twitter. Strubell's exhibition runs from the 1st of June through July 7th . An opening reception will be held on June 10 from 1pm to 3pm. Food, wine, and non-alcoholic beverages will be served. All are welcome. For more information on the exhibit, please contact Southwest Harbor Public Library at (207) 244-7065.